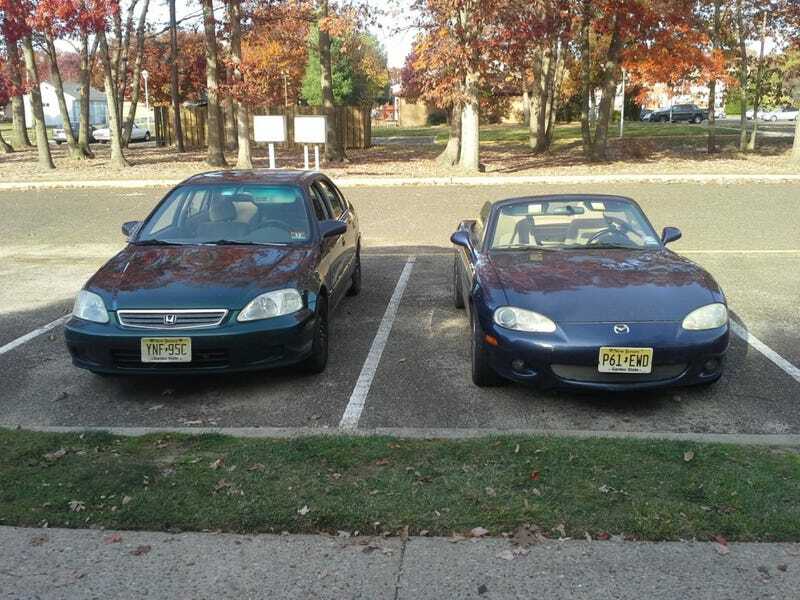 My phone just reminded me that today is the 4 year anniversary of the first time I brought my Miata home and had it parked next to my previous vehicle. That Honda was quite a beater and not really all that fun (autotragic) which was why I wanted something fun like a Miata. Anyways, time for a photo montage down memory lane, considering I might be at the end of the road with this car anyways. The interior of the Miata was minty fresh back then! Hard to keep a tan interior clean when you do a lot of outdoors stuff and never really put the top up. Endless hiking, camping, autox, and track days have certainly taken their toll on the once clean interior. Idk why I bought a car with this much rust but I didnt know at the time why that mattered so much on a Miata. I was entranced in the pure joy of driving around in such a fun and sweet car. I figured “that is later’s problem” and ignore it I did for a long time. I learned to embrace the top down excitement, regardless of the weather almost immediately. With it being mid november in NJ, I put snow tires on it almost right away and enjoyed every minute of my first winter with the car. I would soon learn how much more pleasant a convertible in the summer was. But either way I was having the time of my life. Added my first bits of practicality to car, preparing it to be my ski and bike shuttle any time that I wanted to head up to the mountain. This luggage rack would prove to be useful on many ocassions! Spring rolled around and I went on some great drives with new people! Finally meeting some Oppos in real life. Oh how young the mileage was back then! On the first road trip, the luggage rack came in handy for carrying a fullsize suitcase. This trip took my girlfriend and I down Skyline Drive through Shenadoah and a little bit of the Blue Ridge Parkway and eventually to Florida and back. What an awesome first road trip! I recall the radiator broke on the way home but it made it home before I had to replace it one day on the way to work! My first real “breakdown” but it made it through the 2k+ mile trip without an issue. Was also my first time camping with the car. I was run off the road and into a wall by a maniac driver out of control on the wrong side of the road. I didnt get to see much of that car since I was freaked out by it all. Was a time when I sure wished I had my dash cam then! This was a point almost 1 year into ownership where I thought the journey was nearly done already. There would be no way to affordably fix this. I turned to the used parts community though and patched up what I could and got it back on the road. There would be scars to live with for a long time but I was having too much fun to give up now. I had bought a rear quarter panel as well but it would be a while before I did anything with it. It was acceptable for now, to just keep being my Miata to go on adventures and see the world. My frame of mind certainly shifted at this point to say that the car should get mods and nothing was gonna stop me from continuing to enjoy it. And my second winter included lots of snow time with the car! And new wheels with summer tires on the cheap. They were a little ricey but it was kind of one of those “mod phases” so dont mind me. I eventually got less hellaflush stuff. After determining that the tire rubbing was annoying and those tires sucked, I bought a proper new set of Direzza 102 on a new set of normal fitting wheels and stuck with those up until the present day. Only thing was that I learned I was a true psychopath at that time and bought a set of hoosiers as well for $100 and a set of even shittier wheels (but they fit well) for $75. So $200 all in mounted and balanced, I had a proper set of racing wheels to then be a nutjob and bring to autox events like it was totally normal. I went on another long road trip, this time to the Tail of the Dragon for Miatas At the Gap. What an awesome event where I got to see almost every Miata configuration out there seeing as 500+ drivers showed up! On the way home though some dumb lady in a Volvo ran into me somewhere in Virginia. Add it to the list of things wrong with the body on the car! Insurance money fixed up the bumper and tail light but that was annoying. At least while I was at the shop, I had the paint corrected on the cheap for the couple of panels I had replaced earlier in the year. It came out decently but was somewhat futile considering the rest of my paint was not doing so hot at this age anyways. An excellent winter time Oppo meet! Eventually I put on a great exhaust, installed a roll bar, and a fancy new seat. To prepare my car for track days! Then I found out I could finally fix my quarter panels and rocker panel rust. It was time to make this car whole. Almost immediately after getting started on the body work though, I was given a deadline of maybe a couple of weeks becauseI would be moving across the country to California!! This would mean driving the Miata however it was 4k+ miles. What an adventure to plan and the car was still in pieces. We hurried it up and got it together but paint was not completed at all. It didnt really matter though because it was go time! Paint could just come later but it was time to live my dream and drive across the country and go on another adventure in a new place. Somehwere in Arkansas. I have enough posts about the whole journey and this post is getting long anyways. It was an EPIC trip. The trip of a life time. I eventually made it to California! Soon after arrival I made it to 200k! And I have been posting a crap ton this whole year about my time in LA. Ive driven all over the place, done 5 track days, and took the Miata on the PCH so many times. The future beyond this is however is uncertain. I am fairly certain the car now has a serious rod knock and will be parted out. I see no other way to move forward and not waste my time/money. It would be awesome to keep the car forever but I dont have the space to hold onto to a soon to die car. I cant do an engine swap without great difficulty. And the other rust and lack of paint on the car makes it an impossible situation. Soon I will shop for another Miata to continue the adventure. Maybe I could rebuild this one but financially I have to be smart for once. This is more of a Eulogy than an anniversary post but it is just the reality and I have accepted it!